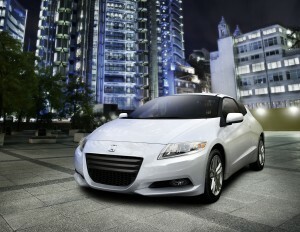 The all-new 2011 Honda CR-Z sport hybrid coupe introduces sleek styling and sporty handling to the hybrid segment. The exterior’s distinctive “one-motion” wedge form originates from its low-slung hood to form a broad forward stance. A side profile with a deeply inset beltline conveys a dynamic tension, while the short wheelbase and large, wide front grille accents the vehicle’s athletic presence. The futuristically styled interior offers a high-tech appearance and ergonomically intuitive controls. Instrument panel illuminates with a three-dimensional, vibrant blue color theme resulting in a multi-layered appearance. The foundation of the 2011 Honda CR-Z’s hybrid powertrain is a 4-cylinder engine that receives additional power from the IMA system’s DC brushless electric motor. The 10-kilowatt electric motor assists in acceleration and also acts as a generator during braking or coasting to capture kinetic energy that recharges the 100-volt IMA nickel-metal hydride battery pack. The system delivers a combined peak output of 122 horsepower and 128 lb-ft. of torque. The two-passenger CR-Z introduces a new three-mode drive system that allows the driver to select between Sport, Econ (Economy) and Normal driving modes. A six-speed manual transmission is standard equipment and a Continuously Variable Transmission (CVT) is available. Standard features on the CR-Z include Vehicle Stability Assist, an AM/FM/CD/USB audio system with six speakers, automatic climate control, power windows and door locks, remote entry and cruise control. This entry was posted in 2011 Car Guide, Car Buying Research Starts Here, Honda_. Bookmark the permalink.